The Cleveland Institute of Art (CIA) has been instrumental in the careers of so many visual artists and designers who make their careers enriching our lives through their work. They can be found making creative contributions throughout the country. 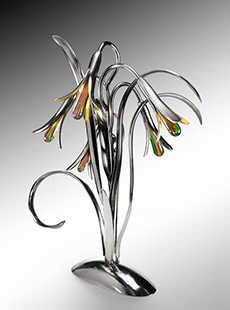 Among them though, is a cadre of artists working in glass who have made their stake here in Northern Ohio, including Carrie Battista, Robert Coby, Scott Goss, Earl O. James, Brent Marshall, Shawn Messenger, Michael Mikula, Marc Petrovic, Kari Russell-Pool, Mark Sudduth, and Linda Zmina. 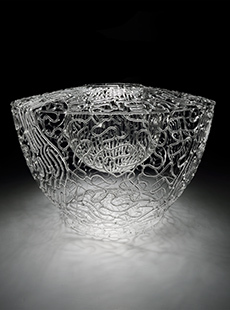 REFRACTION: Glass Art through the Cleveland Institute of Art and Brent Kee Young, which opens Friday, June 10 at Heights Arts, gathers works by these eleven artists who studied at CIA during Brent Kee Young’s tenure as professor and head of the glass department. The word refraction is loosely defined “as the change in direction of a propagating wave, such as light or sound, in passing from one medium to another.” In this Heights Arts exhibition, the title REFRACTION is a metaphor for how these artists have been illuminated and influenced by their study at CIA, as seen in their ensuing creative efforts. The community is invited to a public reception for REFRACTION: Glass Art through the Cleveland Institute of Art and Brent Kee Young on June 10, 6-9 p.m. A related gallery talk, Ekphrastacy: Artists Talk + Poets Respond offers an opportunity to hear both glass artists and local poets speak about the exhibition works on Thursday, July 7, 7 p.m.
REFRACTION will be on view through July 30, 2016.